Holding acupressure points whilst in yoga positions can be incredibly beneficial. Each acupressure point is on a line, or meridian that connects them like dots along muscle lines and neural pathways. Stimulating one of the points on a pathway whilst stretching the rest of the pathway with a yoga posture can ultimately lead to opening the entire neurological aspect of that area and reaping all the health benefits! Here are a few yoga poses paired with acupressure points along with what they could do for you if practiced regularly. Try them during your next home practice and see what you think! Yoga: Stand with your feet more then hips width distance apart and bend your knees until you are in a squat. Your heels may need to come off the ground. Place your elbows on the inside of your knees and push your palms together at heart level. Raise your chest up towards the sky. Acupressure: Let your thumbs rest on the centerline of your chest where they meet and apply some pressure. This entire acupressure line helps open the chest and calm the body. It is great for heartburn, coughs, asthma, and any emotional heartache. 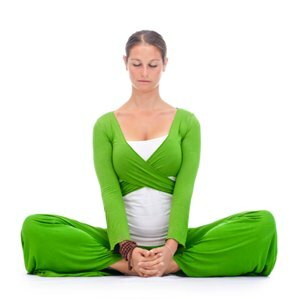 It opens the chest and releases emotion just like squat pose opens the chest and releases the hips. Stay here for at least 30 seconds. Yoga: In a seated position bring your right leg into tree pose keeping your left leg extended out in front. Grab hold of your left big toe with your left hand palm up. Staying fully seated inhale and take your right arm up reaching for the ceiling. On your exhale reach your right arm towards your left foot. Acupressure: To build in the acupressure move your fingers down the inner edge of your left foot to about one third of the way. This often-achy spot is called SP4. Apply pressure here for 30 seconds. The meridian being triggered by this point runs all the way along the muscle line that you can feel stretching in this yoga pose and helps with over thinking, sleep, worry, digestion and clarity of thought. Yoga: From a seated position place the palms of your feet together and let your bent knees relax out to the sides. Use your hands to open the palms of your feet upwards as though reading a book and slowly lean forward. Acupressure: Take your right thumb and place it in the center of the palm of your left foot. Slide your thumb towards the toes until the pad before your toes begin stops you. This is KID1 and is the most grounding acupressure point on the whole body, it is great for any kind of transitional periods in life and highly stressful situations. Hold this pressure point for 30 seconds or more. The meridian that KID1 triggers runs along the insides of your legs (where Bound Angle Pose stretches), and then up your torso parallel with your belly button on both sides. If your face touches your feet with your forward fold in Bound Angle Pose then you can use your knuckles or big toes to stimulate that place directly between your eyebrows (Yin Tang) to create an even more peaceful and calm feeling in the body.